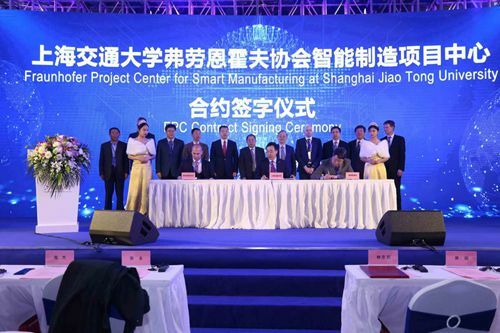 Shanghai Jiao Tong University and Fraunhofer-Gesellschaft Society, the world-largest applied research institution, signed an agreement on March 26 to jointly establish a project center for smart manufacturing in Shanghai. The project center is Fraunhofer-Gesellschaft’s first in China and is designed to facilitate bilateral research on cutting-edge technology based on smart manufacturing and Industry 4.0. The pioneering technology developed at the center will be used to link advanced manufacturing techniques with the Internet of Things and artificial intelligence. Fraunhofer-Gesellschaft Society, founded in 1949 and headquartered in Munich, Germany, is the world's largest research institute for applied science, and is by far the most successful non-profit common technology research and development institution and one of the most efficient technology transfer organizations in the world. With the help of the society, the project center will provide common technical services for key national enterprises and Sino-German joint ventures in various industries such as automobile, aerospace and shipbuilding. Aiming to construct a world-leading Industry 4.0 and smart manufacturing base, the project center will experiment in everything from intelligent factory planning and information physics systems to digital twin technology, artificial intelligence assembly and man-machine integration manufacturing. The center will also roll out a series of educational and training activities for international talents to learn about the latest trends in advanced technology and establish an exchange system for Chinese and German scholars. "The establishment of the project center is a milestone in the upgrading of Shanghai’s manufacturing sector," said Lin Zhongqin, president of Shanghai Jiao Tong University, "the center will propel the city to build itself into a hub of scientific innovation with global influence."